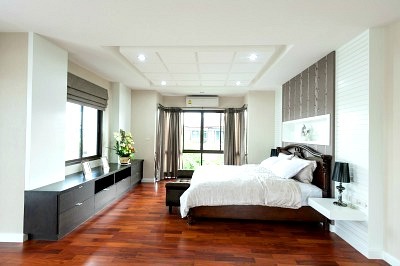 As professional hardwood floor installers, we are passionate about delivering a quality product that fits your budget. Engineered wood flooring is a great option that gives you the look and feel of traditional solid wood floors, but at a much lower cost. The planks consist of several layers that are bonded together by extreme heat and pressure, that makes them less likely to buckle or succumb to changes in humidity or temperature. ​Engineered hardwood floor planks consist of a thin layer of wood backed by several layers of plywood. Because of the way they are manufactured, the planks are not as affected by humidity as solid wood floor planks are, making them a much better option for finished basements, bathrooms, and anywhere you have in-floor heating installed. Like solid wood flooring, engineered hardwood can be sanded down and refinished, but because the top layer of wood is so much thinner, the process can only be performed a few times before having to replace the entire floor. Another great thing about engineered hardwood is that it can be installed very easily over concrete or an existing wood floor. The planks are made with a tongue-in-groove system that lock into each other, making it very simple to replace or repair a small section of the floor if necessary. Our experienced local flooring contractors can quickly install new hardwood floors in your home if you decide to choose this type of flooring. Call us at (404) 341-7071, Sandy Springs Hardwood Flooring to discuss our engineered hardwood flooring options today! ​ You may be thinking that installing engineered hardwood floors is an easy task that you and your buddies can tackle one weekend to save you a little bit of money. You might get halfway through the project and realize that it’s not as easy as you thought, or that somewhere along the way, something was done incorrectly and the whole floor has to be redone. Let us save you the hassle and backache with our affordable and reliable hardwood flooring installation. Manufacturer’s warranty: Most warranties are voided by damages or defects caused by improper installation techniques. Our expert flooring installers will make sure the job is done correctly and that your manufacturer’s warranty stays intact. Proper installation: Each type of wood flooring requires a particular method of installation. We have the experience and knowledge to handle any type of flooring you choose. Whether we staple or glue engineered hardwoods, nail down solid hardwoods, or click together a floating floor, you can be confident that it is installed correctly. Correct materials: As the best wood flooring company in the area, we will take accurate measurements to determine exactly how much subfloor, adhesive, quarter-round, flooring, and other materials are necessary, eliminating the possibility of paying for too much of any materials. Experience and skill: to properly install hardwood flooring, you need a clean and level subfloor. Our skilled flooring contractors know how to prepare the surface, so you don’t risk any future issues with your new flooring. We are ready to show you why we are the top hardwood flooring company in Sandy Springs, GA. Our customer service is top-notch, and our hardwood floor installation cost is very affordable. What are you waiting for? Give us a call at (404) 341-707!